Bonjour! From ordering a café au lait in Paris to making new friends in the Loire Valley, it helps to speak some of the native tongue. Rick Steves, bestselling author of travel guides to Europe, offers well-tested phrases and key words to cover every situation a traveler is likely to encounter. This handy guide provides key phrases for use in everyday circumstances and comes complete with phonetic spelling, an English-French and French-English dictionary, the latest information on European currency and rail transportation, and even a tear-out cheat sheet for continued language practice as you wait in line at the Louvre. 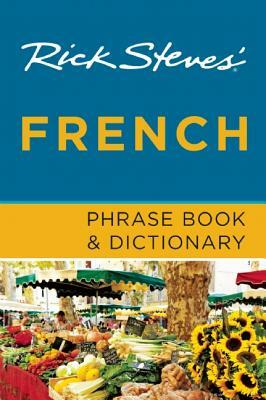 Informative, concise, and practical, Rick Steves' French Phrase Book and Dictionary is an essential item for any traveler's sac à dos. Since 1973, Rick Steves has spent about four months a year exploring Europe. His mission: to empower Americans to have European trips that are fun, affordable, and culturally broadening. Rick produces a best-selling guidebook series, a public television series, and a public radio show, and organizes small-group tours that take over 30,000 travelers to Europe annually. He does all of this with the help of more than 100 well-traveled staff members at Rick Steves' Europe in Edmonds, WA (near Seattle). When not on the road, Rick is active in his church and with advocacy groups focused on economic and social justice, drug policy reform, and ending hunger. To recharge, Rick plays piano, relaxes at his family cabin in the Cascade Mountains, and spends time with his son Andy and daughter Jackie. Find out more about Rick at www.ricksteves.com and on Facebook.